This report, prepared by Association for Democratic Reforms (ADR), focuses on donations received by the National Political Parties, above Rs 20,000, during the Financial Year 2017-18, as submitted by the parties to the Election Commission of India (ECI). The National Parties include Bharatiya Janata Party (BJP), Indian National Congress (INC), Bahujan Samaj Party (BSP), Nationalist Congress Party (NCP), Communist Party of India (CPI), Communist Party of India (Marxist) (CPM) and All India Trinamool Congress (AITC). 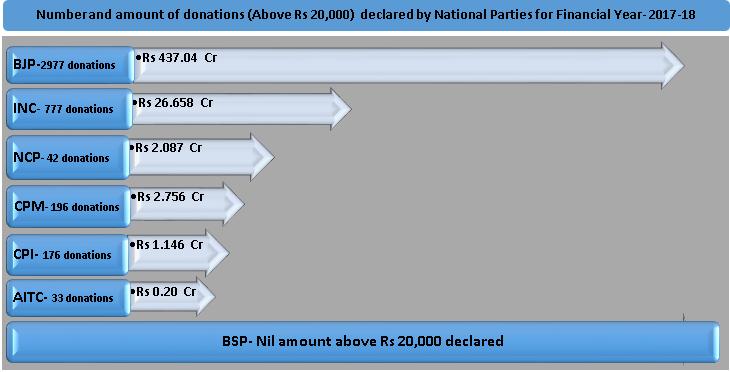 a) The total donations (above Rs 20,000) declared by the National Parties was Rs. 469.89 cr, from 4201 donations. b) A total of Rs 437.04 cr was declared by BJP from 2977 donations while INC declared receiving Rs 26.658 cr from 777 donations. The donations declared by BJP is more than 12 times the aggregate declared by INC, NCP, CPI, CPM and AITC for the same period. c) BSP declared that the party did not receive any donations above Rs 20,000 during FY 2017-18, as it has been declaring for the past 12 years. a) The total donations of the National Parties during FY 2017-18 decreased by Rs 119.49 cr, a decrease of 20%, from the previous financial year, 2016-17.
b) Donations to BJP highest amounts decreased from Rs 532.27 cr during FY 2016-17 to Rs 437.04 cr during FY 2017-18 (18% decrease). c) INC donations decreased from Rs 41.90 cr during FY 2016-17 to Rs 26.658 cr during FY 2017-18 (36% decrease). a) Segregation of donations according to State was made by ADR based on the address provided by the parties in their donations report to the ECI. b) A total of Rs 208.56 cr was donated to the National Parties from Delhi, followed by Rs 71.93 cr from Maharashtra and Rs 44.02 cr from Gujarat. c) A total of Rs 42.60 cr, (9.07% of total donations received by the National parties, FY 2017-18), could not be attributed to any State/ Union Territory due to incomplete information provided by the parties. a. 1361 donations to the National Parties were made by corporate/business sectors amounting to Rs 422.04 cr (89.82% of total donations) while 2772 individual donors donated Rs 47.12 cr (10.03% of total donations) to the parties during FY 2017-18. 1207 donations from corporate/business sectors were made to BJP (Rs 400.23 cr) while 1759 individual donors donated Rs 36.71 cr to the party during FY 2017-18. INC received a total of Rs 19.298 cr via 53 donations from corporate/business sectors and Rs 7.36 cr via 724 individual donors during FY 2017-18.
a. Prudent Electoral Trust donated a total of Rs 164.30 cr to BJP and INC together and is one of the top 2 donors to the two parties. The Trust donated Rs 154.30 cr to BJP (35% of total funds received by the party) and Rs10cr to INC (38% of total funds received by the party). b. NCP received Rs 50 lakhs from B.G. Shirke Construction Technology Pvt. Ltd. and Rs 50 lakhs from Jankalyan Electoral Trust Mumbai. c. For top 10 donors to National Parties, refer Annexure -1. Incomplete disclosure of information in the donations report: There is still ambiguity in details of donations declared by the National Parties for FY 2017-18.
a) Of the 7 National Parties, 4 parties, BJP, INC, CPI and CPM had not declared PAN details of 219 donations through which the parties collected a total of Rs 4.95 cr. BJP collected Rs 4.01 cr from 119 donations but failed to provide PAN details of donors. CPI collected Rs 75.50 lakhs from 70 donations without PAN. 26 donations to INC (Rs 16.40 lakh) and 4 donations from CPM (Rs 2.30 lakhs) do not have PAN details. b) 4 National Parties (BJP, INC, CPM and AITC) have declared Rs 80 lakhs donations from 60 incomplete/Incorrect PAN details FY- 2017-18.
c) AITC has not provided cheque number, bank on which it was drawn and the date on which the cheque was received/ encashed for any of its 33 donors who contributed a total of Rs 20.25 lakhs. Thus, without the complete cheque/DD details, it would be a time consuming process to link the donors against their donations and hence trace the money trail. d) CPI has also not declared the details of cheque and DD (cheque number, bank on which it was drawn and the date) for a total of 82 donations through which the party received Rs 44.35 lakhs. e) CPI has not provided the names and PAN number of 50 donations of state secretaries and districts councils of the party though their contributions amount to Rs 53.57 lakhs while the party collected Rs 75.50 lakhs from 70 donations without PAN. The Supreme Court gave a judgment on September 13, 2013 declaring that no part of a candidate’s affidavit should be left blank. Similarly, no part of the Form 24A submitted by political parties providing details of donations above Rs 20,000 should be blank. 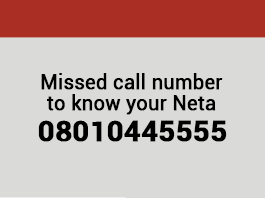 Full details of all donors should be made available for public scrutiny under the RTI. Some countries where this is done include Bhutan, Nepal, Germany, France, Italy, Brazil, Bulgaria, the US and Japan. In none of these countries is it possible for nearly 50% of the source of funds to be unknown, but at present it is so in India. The National and Regional Parties should, ideally, lead by example by filing complete and correct statements of donations to the ECI well in time for public scrutiny so as to encourage financial transparency.